for cmd.exe many keys do not work, especially delete, backspace and the arrow keys (so no command history yet). I am not sure how to do this yet, probably this needs some more internal changes. for sh.exe it seems that at least the backspace key is working, but there is no output of the prompt and ls has some strange output too. For both there is no colored output available yet. The biggest problem though is that the konsole window can't be made transparent ;-). 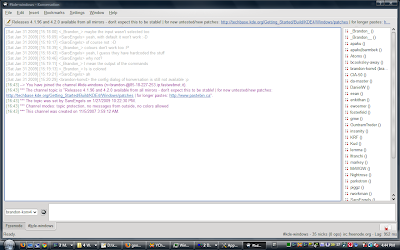 Just another great application has been added in a porting branch into svn recently: konversation. And as _Brandon_ hasn't been lazy altogether, konversation4 already works like a charm here. You should be aware that although konversation does more or less work and it gets better and better every hour thanks to a number of people, it should not be used yet and no bug reports should be filed yet. How does the "port" work? Is it some platform-specific #ifdef or a separate branch on repository? 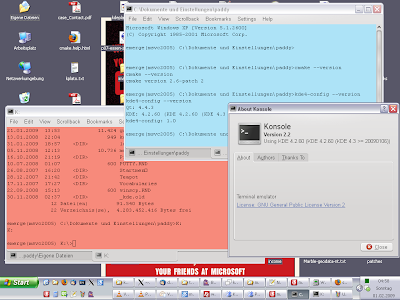 LOL, cmd.exe inside of Konsole. Never thought of that, although it's perfectly reasonable. If it's on par with cmd.exe's native window (cope&paste, history, arrow) plus has bonus features like tabs, there's nothing we can complain about. Love KDE on Windows so far, thanks for the hard work! Congratz on this development Partick. I've presented konsole for win32 to my coworkers and they were impressed! 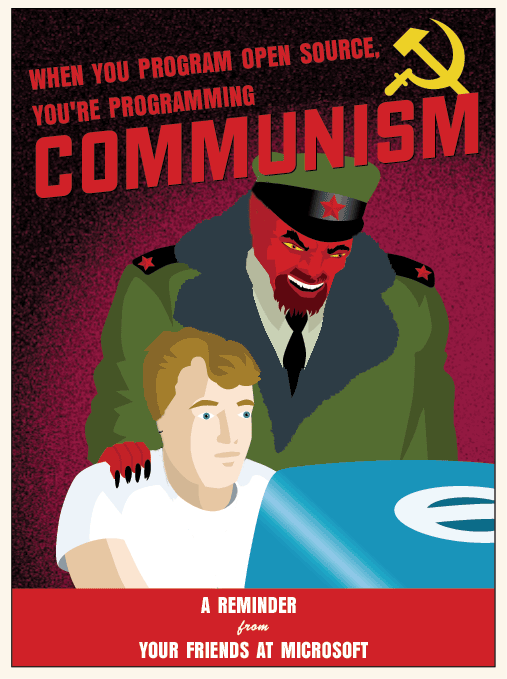 Still, is there any possible way of getting either the CMD.exe to look like Konsole, or to get Konsole on Windows working with transparency and colours, etc? hm thought that quassel will be the next default irc-client?! Quassel is not a KDE app and is developed outside of KDE.org. So it cannot be the default KDE IRC client. The de facto IRC client being developed inside of KDE is Konversation, which is on its way to KDE 4. @SDiZ: yes, there are some platform specific #ifdefs, but I will soon commit it into trunk. Also I plan to add a patch for >=4.2.1 on Windows. @Jean Azzopardi: for a more stable application, rather use console2 as Brandon said - konsole itself will still need some time.